Weihnachtsoratorium (Christmas Oratorio), in six parts, BWV 248 (BC D7): How shall I fitly meet thee? Adolphe Adam; Arvo Pärt; Bob Chilcott; Boris Ord; Carl Rütti; Christmas Traditional; Felix Mendelssohn; Francis Jackson;... Very Good. In very good packaging. 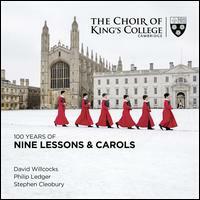 Choir of King's College C-100 Years Of Nine Lessons & Carols by Choir of King's College C.
Adolphe Adam; Arvo Pärt; Bob Chilcott; Boris Ord; Carl Rütti; Christmas Traditional; Felix Mendelssohn; Francis Jackson;... Fine. In fine packaging. Choir of King's College C-100 Years Of Nine Lessons & Carols by Choir of King's College C.
Adolphe Adam; Arvo Pärt; Bob Chilcott; Boris Ord; Carl Rütti; Christmas Traditional; Felix Mendelssohn; Francis Jackson;... New.